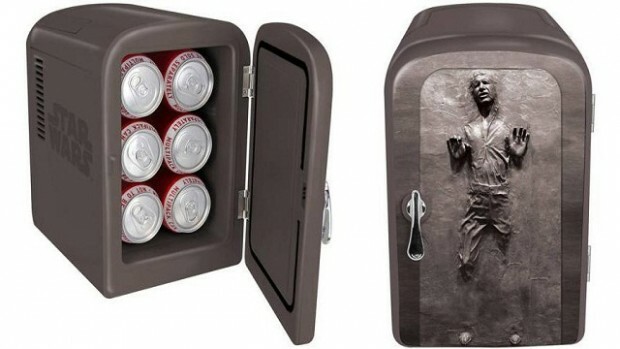 I’ve seen quite a few geeky mini fridges lately, from Han Solo in Carbonite to Iron Man. While it’s great that there are so many options for geeks to choose from, none of them have grabbed me personally. So if it were up to me, I’d make a design based on the TMNT Party Wagon. The box shape is optimal for storage, and that iconic door (used for ramming Foot ninjas) swings open like a fridge door, so it’s a perfect fit. The one shown here is big enough for a 12-pack of soda and a sandwich. However if the wheels were entirely on the outside of cabin there’d be even more room for food. You could even upscale this van for a much larger fridge, with storage in the door too. This could also be down-scaled to fit 4-6 sodas so it doesn’t take up too much room on your desk. That could also be a bed ! Someone already made a VW bus van bunk bed IRL, so I didn’t want to copy that.